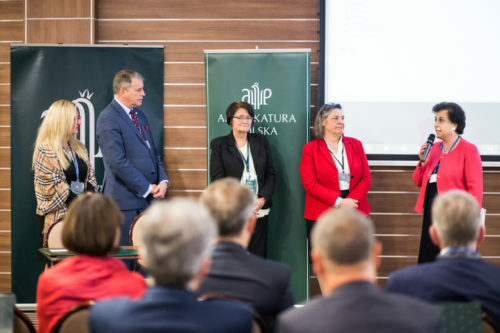 On February 8 – 10, 2018 Maria Ślązak, President of the European Association of Lawyers represented our Association as a speaker during the 46th European Presidents’ Conference. AEA-EAL Past Presidents Monique Stengel and Konrad Meingast also participated this event. 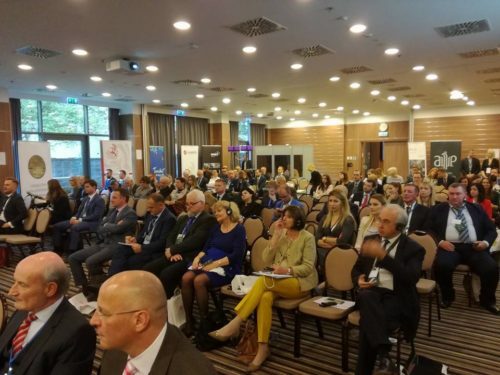 The convention is the oldest and the biggest summit of the highest representatives of European lawyers. Also, many organizations from the outside of our continent are represented each year in Vienna. During their stay in the capital city of Austria, the participants are hosted by the Federal Chancellor, the Federal Minister of Justice and the Mayor of the City of Vienna. The fact that more than 200 top lawyers are present each year, serves as a proof for the importance the Presidents’ Conference. This meeting is a forum not only for exchanging opinions and views, but also for filling information deficits, debating different viewpoints and developing strategies as well as for informal talks. It is also a tradition that bars, law societies and international organizations of lawyers submits each year reports on their activities and international domestic developments that occurred within the passing year. This year the topic was “Self-regulation or heteronomy – lawyers’ independence in danger?”. 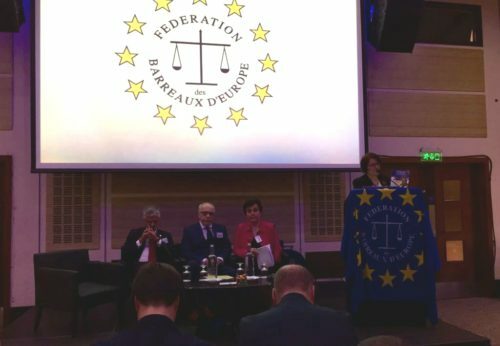 Maria Slazak was one of four speakers who delivered presentations and was speaking, among others, about international guarantees for Lawyers’ independence and self-government with conclusion that proposed European Convention on a Profession of a Lawyer is more than needed due to the fact that existing legal instruments have non-binding character (resolutions, declarations or recommendations) and the Convention will include an enforcement mechanism also for these Member States, where independence and/ or self-regulation is problematic or threatened. She also underlined that it is crucial for every lawyer to take into account mission of the profession towards citizens and society and not profits only. The presentation was welcomed with great interest from the participants (see below letter from President of the Austrian Bar). During meetings in Vienna AEA-EAL President met with representatives of several Bars, international organizations of lawyers and institutions, including Christiane Wendehorst, President of the European Law Institute (ELI). She met also with the delegation of Serbian Bar Association, with President and Vice-President of the International Organization of Young Lawyers (AJIA) and with the President of the Kazakhstan Bar Association, with whom a preparation of the common conference in Almaty (June 15-16) was discussed. Also a meeting of AEA-EAL President and AEA-EAL Past Presidents took place, during which important issues for the Association were discussed. Vienna events was closed by a traditional Ball of Lawyers in the Halls of Hofburg Castle. This Ball closes carnival season in the Austrian capital. UNESCO: Holocaust Remembrance and Education: our shared responsibility. Since 2002, 27th January has been instituted in Europe the international Day of commemoration in Memory of the victims of the holocaust and prevention of crimes against Humanity. In France, this day is dedicated to the memory of all genocides and to the prevention of crimes against humanity. If this date has been chosen in memory to the date of liberation of the cam in Auschwitz-Brikenau, it has become a date of commemoration but also a day of prevention, specially for young generations to prevent such new crimes. 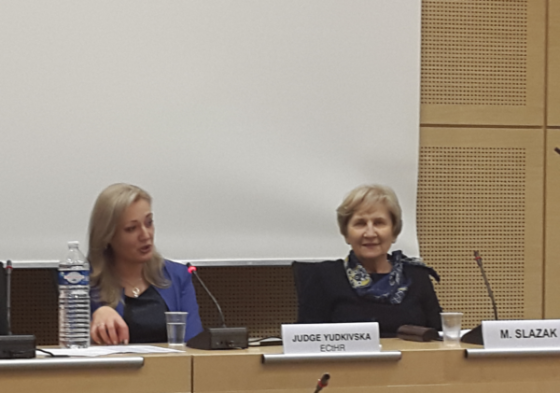 On January 25, 2018 Monique Stengel, Past President of the AEA-EAL participated in the International Holocaust Remembrance Day, organized by UNESCO under the main title: Holocaust Remembrance and Education: our shared responsibility. WIth this occasion Mr Robert Badinter, lawyer and professor of law, published an important article in the UNESCO Courier – “Anti-Semitism: Learning the lessons of history”. Our present international actuality shows that, unfortunately, the lessons of the History don’t avoid similar violent acts and violation of human rights, also against lawyers as we could see a few days ago, on 24. January, during the Day of Lawyers in danger. It is our duty as citizen and our role as lawyer to be watchful and to act to report and act against all sorts of violation against human rights and humanity. Depuis 2002, le 27 janvier a été instituée en Europe journée de mémoire de l’Holocauste et de prévention des crimes contre l’humanité. En France, cette journée est intitulée journée de la mémoire des génocides et de la prévention des crimes contre l’humanité. En effet, si cette date a été choisie comme étant celle de la libération du camp d’Auschwitz-Birkenau, c’est devenue la journée consacrée au souvenir mais aussi à la prévention et, notamment, à l’éducation des jeunes pour prévenir la survenance de tels crimes. Ainsi, j’ai pu assister le 25 janvier dernier à Paris, au siège de l’UNESCO, à la journée internationale organisée sous le titre “Mémoire et enseignement de l’Holocauste: notre responsabilité partagée”. Comme le souligne Robert Badinter, Avocat et professeur de droit, dans le “Courrier de l’Unesco” à cette occasion, “l’histoire nous invite à la vigilance”. Notre actualité internationale montre que, malheureusement, les leçons de l’Histoire n’empêche pas la survenance d’actes de violence et atteintes contre les droits de l’Homme, y compris contre les avocats comme nous avons dû le constater le 24 janvier dernier, à l’occasion de la journée de l’avocat en danger. Il est de notre devoir de citoyen et notre rôle d’Avocat d’être vigilants et d’agir pour signaler et lutter contre toutes ces atteintes aux droits de l’homme et à l’humanité.